I got Mizzie all excited about going outside so I could demonstrate how an open door doesn't mean she can charge out of it. This is a good technique to use if your dog gets excited when people come to the door, or if you dog tries to escape through doors. Notice how the exercise is done in virtual silence, the main form of communication is body language. You can use this techniques in many situations; keeping your dog sat waiting whilst you prepare it's dinner, whilst you prepare for a walk, keeping your dog sitting away from the table as you eat, if your dog attacks the hoover you can use this technique to ask it to simply sit and watch, etc etc. The applications are endless. Of course you should also use treats to reward your dog for choosing to sit and relax during this exercise therefore making it a much more positive experience for you both. A little video I use to explain the body language dogs use to communicate. Here, during play, many signals and gestures are given in rapid succession to communicate, "lets play", "I'm no threat", "I trust you", "you can trust me", "lets keep this fun" etc etc. The signals I highlighted are just the main ones, there is literally no time when some body language isn't being offered! 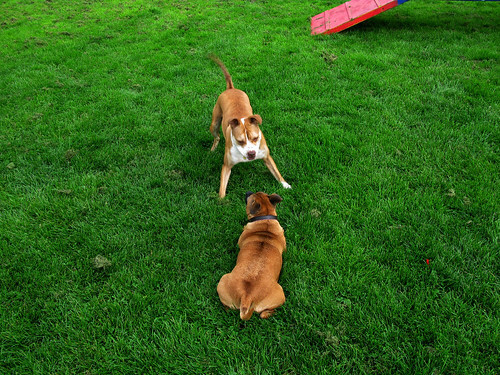 Both these dogs, a Staffie and a Staffie cross were from North Clwyd Animal Rescue Centre. What breeders have 'achieved' with the English Bull terriers head within 100 years. Selective breeding taking evolution way beyond the necessary, to the point of natural extinction.